U.S. District Court Judge Howard Boyd Turrentine was 70 in 1984 when he became a senior judge and could have worked a reduced schedule, but he carried an active calendar another 23 years, retiring only when his health declined. During his 40-year tenure, he spent 15,255 hours on the bench, presiding over such complex litigation as distribution of water in Imperial Valley to an interpretation of the Atomic Energy Act enjoying cases that were intellectually challenging. 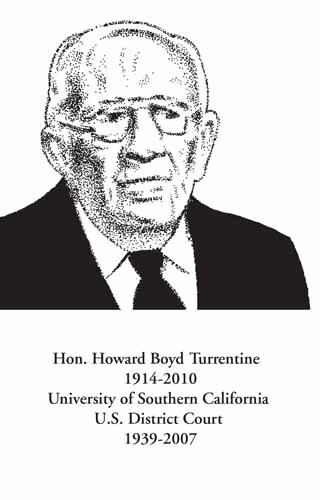 Following the advice of his uncle, Superior Court Judge Lawrence N. Turrentine, he pursued a legal career, paying his way through the University of Southern California Law School by servicing vending machines and selling newspapers. He graduated in 1939 and was admitted to the California Bar later that year. In 1940, he was appointed Assistant City Prosecutor in San Diego and remained until the spring of 1941 when he was called to active duty in the U.S. Navy. He served through all of World War II, rising to the rank of lieutenant commander and receiving several awards including the Commendation Medal for his intelligence work during the Philippine Campaign and preparation for the Battle of Surigao Strait in 1944. In 1945 Judge Turrentine opened his first law practice in San Diego before being appointed to the Superior court in 1968 by Governor Ronald Reagan. He was appointed U.S. District Court Judge by President Richard M. Nixon on April 27, 1970 and from 1982 to 1984 served as chief judge of the U.S. District Court. Even more than the judge’s legal acumen was his compassion for all who appeared before him in court, and he felt humbled by the awesome responsibility of taking away a person’s freedom and sentencing him or her to prison. Off the bench, Judge Turrentine was an avid hunter and fisherman, enjoying trips throughout the country into his 90s. He also visited more than 50 countries, counting Antarctica and New York City as his favorite places on the map.